Is there a better alternative to PDF Merge? Is PDF Merge really the best app in Image Editing category? Will PDF Merge work good on macOS 10.13.4? 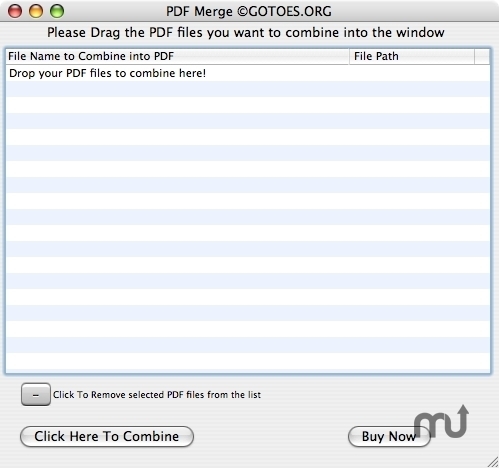 PDF Merge lets you combine multiple PDF files into one. Simply Drag and Drop several PDF files on to the program icon. A box will appear allowing you to change the order in which the files are joined. You can move the files up and down in the list. Once you are done, you will be prompted to specify a name for the new concatenated file. It will appear on your desktop. The Registered version of PDF merge will take any number of PDF files, and combine them into one single PDF file. The latest version of PDF merge also allows you to insert images into your PDF file. PDF Merge accepts .png, .jpg, .gif, and .tiff image files for incorporation into merged PDFs.